Prepare ahead and freeze until ready to serve! Preheat oven to 375 degrees F. Stir flour, cinnamon, ginger, baking powder, nutmeg and salt; set aside. In large mixer bowl, beat eggs on high speed for 3 minutes. Add sugar, pumpkin and lemon juice and mix on low until blended. Line an 11 x 16 inch jelly roll pan with parchment or waxed paper. Spread batter over paper and sprinkle with nuts. Bake at 375 degrees F for 12 to 15 minutes. Immediately remove from oven and cover with a clean, dry kitchen towel and turn onto counter so bottom of cake roll is facing upwards. Do not remove paper. Beginning at narrow end, roll up cake (including towel and paper) jelly roll style and cool. When cake has cooled, unroll, remove paper, spread with filling, roll up cake (leaving towel). Wrap cake roll with plastic wrap and chill. Slice to serve. 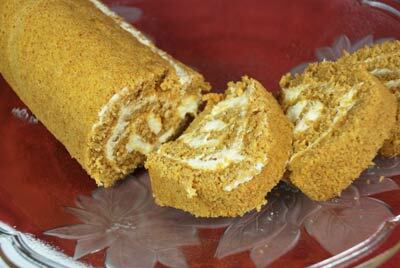 Cake roll can be prepared in advance and frozen.